The album cover to the original 1982 "Blade Runner" soundtrack (Courtesy of Warner Bros. Entertainment). The album cover to the original 1982 “Blade Runner” soundtrack (Courtesy of Warner Bros. Entertainment). I believe that a truly great soundtrack can and must do both. The entire score must holistically serve the tone, content and themes of the film, but individual tracks must also be memorable in their own right. I was thinking about this very topic in the days after I saw “Blade Runner 2049.” The music did an excellent job serving the visuals of the film, but it wasn’t especially memorable. While this was slightly disappointing, the silver lining is that I was reminded of the original film’s score. Greek composer Vangelis’ score for the 1982 film “Blade Runner” is, without a doubt, the embodiment of film music perfection. “Blade Runner,” as a film is both a film-noir/detective story and an epic, philosophical exploration of what it means to be human. As such, the film calls for a soundtrack that can be described as not only intimate and lonely, but also grandiose and sweeping. In addition, the cyberpunk aesthetic central to the artistic composition of the film must be maintained in the score. The score ends up being a synthesis of jazz, classical music, cyberpunk electronica and Middle Eastern music. Vangelis was able to match the visuals and themes of the film beat for beat through the combined use of traditional film noir instrumentation and the decidedly non-traditional Yamaha CS-80 synthesizer. When the film is shadowy, lonely and contemplative, the jazz sensibilities creep in. When Rick Deckard explores the seedy underbelly of Los Angeles circa 2019, we hear the electronica and Middle Eastern notes enter the fray. When the film reaches its philosophical and emotional climax in its last act, the sweeping synths dominate. “Main Titles/Prologue” accompanies both the opening text exposition and the scenes of an industrial Los Angeles circa 2019. The songs establish a very specific type of film world — a film world that simultaneously invites the audience to bask in its wonder and mystery and to be wary of its cold, industrial and unforgiving nature. The song is so memorable because all of the standard instrumentation for classical music film scores is rejected in lieu of that essential synthesizer. 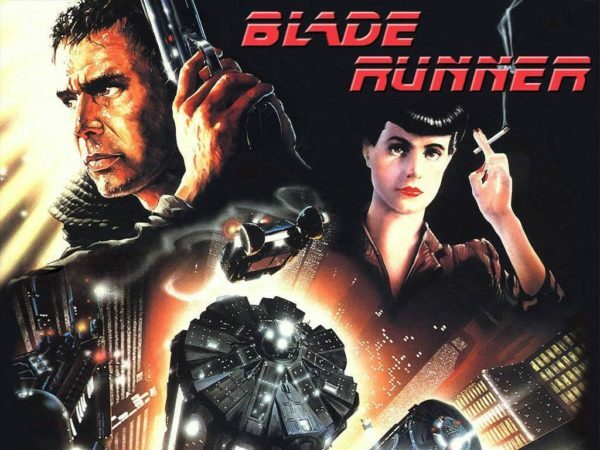 The track “Blade Runner Blues” appears twice in the film. Both instances contain the most decidedly neo-noirish imagery of the entire film. It first plays when Rick Deckard retires the replicant Zhora. The imagery of her crashing through panes of glass and ultimately dying in a flurry of artificial snow matched with the song evoke the colder, more emotionally ambiguous notes of hardboiled detective stories. The second time it plays, Rick sits alone in his apartment with his glass of whiskey, his piano and the neon lights outside his window. You can almost hear the bluesy saxophone playing until you realize that it isn’t a saxophone at all, but rather, once again, the synthesizer. Finally, “Tears in Rain” accompanies the eponymous Tears in Rain soliloquy delivered in the third act of the film. It begins with the synth strings and synth bells from the “Main Titles/Prologue,” and these elements get louder and louder as the music swells. They are blocked momentarily by the sound of timpani, only to resume once again. This structure has a very specific emotional impact on the audience. The familiar motifs from the “Main Titles/Prologue” bring the audience into a state of deep longing and remembrance. These timpani metaphorically interrupt this state by reminding us of the inevitability of death. When the motifs return, we are encouraged to return to that same emotional state, only now possessing the knowledge that death does not make our memories any less important. The balance between noir and epic sensibilities reach their apex with this song and its respective scene. Rick’s deeply moving death soliloquy is given within the visual context of deep shadows, neon lights, the image of a dove flying away into the nights. Life and death are matched beat for beat by the music, spoken word, and the visuals. Ordinarily, the recommendation to listen to a film’s score isn’t a recommendation to see the film it accompanies, and the same holds true in the reverse. However, “Blade Runner” and its respective soundtrack are the exception to this rule. Both stand as works on their own, but they add up to something more than the sum of their parts. It is ultimately for this reason that the Vangelis’ score is a truly great piece of cinematic music, and it should not be missed. Contact Hamza Ali Zahurullah at hamzaz98 ‘at’ stanford.edu.